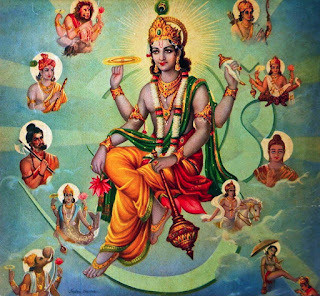 In our country and some neighboring countries Lord Sri Rama and Lord Sri Krishna and many other great men are worshiped as ‘Avataras’ of Lord Vishnu. Innumerable Devotees throng to listen to their sacred stories repeatedly and seek to get blessed. In summary, the concept of ‘Avatara’ or loosely Incarnation is part and parcel of our Bharatiya society. However, the concept of incarnation itself raises many questions. Incarnation of a Lord who is omnipresent seems to be an oxymoron. ‘Ava-tarana’ means ‘to descend’. Does it then imply, that if He descends, the place he had earlier occupied is now empty ? He is said to be omnipresent. If this is so, isn’t it meaningless to say that He descends from one place to the other. Hence Bhagawan has neither entry nor exit, thereby falsifying the notion of ‘avatara’ or incarnation. The Lord is immanent. There is no need for Him to incarnate for destruction of the wicked and ‘adharmi’’. He is all powerful and all-knowing. He can simply bring about change in the wicked one’s thinking from within. Whence the need for incarnation? Isn’t it sufficient to respect them as ideal individuals? Do we have to deify them? The sages have established by means of their practical experience that in order to measure divinity one needs extrasensory perception. Hence it is said ‘Drushyathe jnanachakshurbhihi tapaschakshurbhirevacha ….’. In addition, first-hand experience, reason-logic and truthful testimony are the basis on which we understand the truth. In context of avatara, innumerable renderings based on the personalized (factual) experience, reason and a blend thereof abound in Bharatiya literature. In addition, history has also recorded, the vision and experiences of these avataras in sadhakas in varied periods and places. Keeping in view the above, we attempt below to answer the questions raised afore on the topic of incarnation. In a spiritual sense, Bhagawan is immune to alternating rise and fall. He is ever complete – whole and square. He is free of the repeated births and deaths on account of past karma. Incarnation ascribed to Him is only notional. Whenever He reveals himself to the jeevas of His own will, then that is termed as ‘avatara’. His incarnation is an appearance in our time and space and not a literal descent. So the question of vacancy in his original place after incarnation and other such objections are pretty puerile. He is omnipresent and complete. The theology which terms the cycle of birth and death as a deviation from ideal also extols Him thus ‘Ajayamaano bahudha vijaayate’ – which means he is unborn yet takes different forms. It is not a fall to this mortal frame due to the cycle of birth and death, but descent of his own volition. This does not constitute vikaara. As the immanent and almighty force it is not impossible for him to achieve his objective from within. That being so, can he not choose to grant his devotees the most elevating visual treat of his divine and beautiful form both within themselves and without? Does he not have that freedom? The ‘Avatara Purushas’ are verily a pure object of meditation for aspirants and can grant them the both Bhoga and Moksha – i.e. material benefit and spiritual liberation. Before, during and even after their term of incarnation, their effect pervades and persists. However, a human who has attained realization by performance or penance may not have such ability to influence the sadhana of aspirants. If a leader were to have an ideal lifestyle his followers can at the most be religious. The concept of incarnation which is mystical has been woven into the life of Bharatiyas like warp and woof due to the spiritual inner experience of the Rishis who were beyond the senses.